The friary was founded in 1464 and suppressed in 1539-40. The friars were expelled in 1581 but re-established the house in 1633. It was abandoned c.1760. 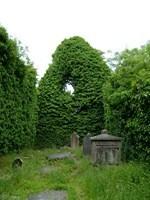 Today it is a ruin accessed through Adare Manor Golf Club. The River Maigue which flows past the town of Adare is part of the Lower River Shannon Special Area of Conservation (SAC). One of the prettiest villages in Ireland, Adare is designated as a Heritage Town owing to its number of extant medieval buildings - three medieval religious houses and a castle and other historic stylised architecture in the main street. Adare Woodlands are designated as a proposed Natural Heritage Area (pNHA). Founded c.1254 AD, Ardfert friary flourished until 1584 when the friars were expelled. However, the friars returned c.1615. It became abandoned again sometime before 1766. Impressive ruins stand at this site today with much of the nave, transept chapels, the tower and part of the cloister intact. Around 3 kms west of Ardfert friary is the coast along which is the Akeragh, Banna and Barrow Harbour SAC and pNHA. To the west and south are different components of the Tralee Bay Complex Special Protection Area (SPA), a wonderful habitat supporting internationally important populations for a variety of wetland and water birds. Tralee Bay is also a Ramsar site - internationally important wetlands. 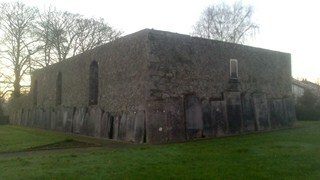 The friary was founded in 1263, and flourished until 1565 and 1587 when the friars were driven out - yet they persevered. Friars were still in Armagh in 1766. During the persecutions, their places of refuge were at Brantry, Co. Tyrone and Creggan, Co. Armagh. Some nave walls are still extant including the facade and some of the arches. If you like walking, the Palace Demesne and the Garden of the Senses comprising 300 acres, created by Church of Ireland Archbishop Richard Robinson is now open to the public. This friary was founded in 1240 AD, and flourished until it was destroyed in 1567-8. During the persecutions, friars remained in the area by staying in places of refuge at Bellaneeny, Co. Roscommon and Friars' Island. The friars began to build a new friary in 1680 but this was never completed, part of it being used in the siege of Athlone in 1691. Only two friars remained in Athlone in 1766, but another friary was built in the town in 1869, and the friars continue to minister there to this day. Athlone is situated on the River Shannon, and is an important crossing point for people travelling from Dublin and the east to the west of Ireland. North of Athlone is the Lough Ree SAC, SPA and pNHA while south of the town is the River Shannon Callows SAC and pNHA and the Middle Shannon Callows SPA. Also to the south of the town on the western side of the river is the Carrickynaghtan Bog NHA. To the east of the town is the Crosswood Bog SAC and pNHA and Carn Park Bog SAC and pNHA. To the east of Friars' Island on Killinure Lough - a smaller "lake" on Lough Ree - is Waterstown Lake pNHA. Other protected sites lie a few kilometres to the west of Athlone also. This friary in Ballymote village was originally built as a Third Order Regular Franciscan friary but was occupied by the friars between 1650 and 1700. By 1766 it was abandoned. This friary in Ballymote village was originally built as a Third Order Regular Franciscan friary but was occupied by friars between 1650 and 1700. By 1766 it was abandoned. Around 3 kms northwest of this historic village with its impressive early 14th century castle and ivy-covered friary ruins is the Templehouse and Cloonacleigha Loughs SAC comprising three small lakes, wetlands and mixed woodlands. The local people have created a pleasant park around the castle with a small area dedicated to wildflowers and butterflies.